The ABLE 2A and 2B (Atmospheric Boundary Layer Experiments) data consists of estimates of the rate of exchange of a wide variety of aerosols and gases between the Amazon Basin and its atmospheric boundary layer, and the processes by which these aerosols and gases are moved between the boundary layer and the free troposphere. The data are presented in gzipped ASCII text files in Global Tropospheric Experiment (GTE) format. The ABLE-2 project consisted of two expeditions: the first in the Amazonian dry season (ABLE-2A, July-August 1985); and the second in the wet season (ABLE-2B, April-May 1987). The ABLE-2 core research data were gathered by NASA Electra aircraft flights that stretched from Belem, at the mouth of the Amazon River, west to Tabatinga, on the Brazil-Colombia border, from a base at Manaus in the heart of the forest. See Figure 1. These observations were supplemented by ground based chemical and meteorological measurements in the dry forest, the Amazon floodplain, and the tributary rivers through use of enclosures, an instrumented tower in the jungle, a large tethered balloon, and weather and ozone sondes. Figure 1. Area of ABLE-2A Expedition, dry season, July-August 1985 and Area of ABLE-2B Expedition, wet season, April- May 1987. This study showed air above the Amazon jungle to be extremely clean during the wet season but air quality deteriorated dramatically during the dry season as the result of biomass burning, performed mostly at the edges of the forest. Biomass burning is also a source of greenhouse gases carbon dioxide and methane, as well as other pollutants (carbon monoxide and oxides of nitrogen). Amazonian ozone deposition rates were found to be 5 to 50 times higher than those previously measured over pine forests and water surfaces. The Amazon River floodplain is a globally significant source of methane, supplying about 12% of the estimated worldwide total from all wetlands sources. Over Amazonia, carbon monoxide is enhanced by factors ranging from 1.2 to 2.7 by comparison with adjacent regions due to isoprene oxidation and biomass burning. Over the rainforest individual convective storms transport 200 megatons of air per hour, of which 3 megatons is water vapor that releases 100,000 megawatts of energy into the atmosphere through condensation into rain. The ABLE was a collaboration of U.S. and Brazilian scientists sponsored by NASA and Instituto Nacional de Pesquisas Espaciais (INPE) and supported by the Global Tropospheric Experiment (GTE) component of the NASA Tropospheric Chemistry Program. The processed, quality controlled and integrated data in the documented Pre-LBA data sets were originally published as a set of three CD_ROMs (Marengo and Victoria, 1998) but are now archived individually. The Pre-LBA data set collection was dedicated to providing information to the LBA research community about existing data that have been collected in Amazonia during the 20 years prior to 1998. The main goal of this activity was to compile and document existing data sets in a consistent manner and make them available prior to the beginning of the LBA experiment. The data set compilation efforts included satellite imagery, micrometeorological observations, near surface and upperair atmospheric conditions, surface biophysical and hydrological measurements obtained from 1970s-1990s in a number of field experiments. Data were collected for several intensive field campaigns, during the rainy and dry seasons, and other periods that vary from short intensive field campaigns to several years worth of observations, measured sometimes with a time resolution of 5 minutes and 1 hour. Harriss, R.C. 2008. Pre-LBA ABLE-2A and ABLE-2B Expedition Data. Data set. Available on-line [http://daac.ornl.gov] from Oak Ridge National Laboratory Distributed Active Archive Center, Oak Ridge, Tennessee, U.S.A. doi:10.3334/ORNLDAAC/897. Marengo, J.A., and R.L. Victoria. 1998. Pre-LBA Data Sets Initiative, 3 vols. [Pre-Large-Scale Biosphere- Atmosphere Experiment in Amazonia Data Sets Initiative, 3 vols.]. CD-ROM. Centro de Previsao de Tempo e Estudios Climaticos, Instituto Nacional de Pesquisas Espaciais (CPTEC/INPE) [Center for Weather Forecasting and Climate Study, National Institute for Space Research], Sao Paulo, Brazil. The ABLE-2 project consisted of two expeditions: the first in the Amazonian dry season (ABLE-2A, July-August 1985); and the second in the wet season (ABLE-2B, April-May 1987). The ABLE-2 core research data were gathered by NASA Electra aircraft flights that stretched from Belem, at the mouth of the Amazon River, west to Tabatinga, on the Brazil-Colombia border, from a base at Manaus in the heart of the forest. These observations were supplemented by ground based chemical and meteorological measurements in the dry forest, the Amazon floodplain, and the tributary rivers through use of enclosures, an instrumented tower in the jungle, a large tethered balloon, and weather and ozone sondes. FITZGARRALD Data not included. See GTE ABLE-2A web site. ZIMMERMAN Data not included. See GTE ABLE-2A web site. THESE DATA HAVE BEEN PROCESSED TO CONFORM TO THE GTE DATA ARCHIVE FORMAT. Nowhere is the atmosphere-biosphere interaction more pronounced than within the atmospheric boundary layer--the lowest few hundred meters of the atmosphere. This layer of the atmosphere contains trace gases emitted by the biosphere, produced by industrial activity and combustion, or formed by atmospheric chemistry processes. While in the atmosphere, such trace materials undergo photochemical reactions that influence the horizontal and vertical distributions of reaction products. Within the lower layers of the atmosphere, powerful dynamical processes are also at work. These processes mix the boundary layer air, bringing gases to the land surface and moving layers to the upper troposphere, where long-range transport takes place and local flux processes are transformed into globally significant effects. Because of the great importance of trace-gas fluxes and their coupling to the global atmosphere, the first extensive GTE field studies were focused on these processes. The GTE/ABLE investigations have brought international research teams into some of the most important and sensitive ecosystems in the world. Their findings have already revised previous views of the atmosphere-biosphere interaction and the relative importance of different ecosystems in generating atmospheric change. The atmosphere often does not behave in accordance with predictions based on previous, more limited data; sometimes the differences are startling. The tropical rain forest have long been recognized as key participants in the atmosphere-biosphere interaction. These vast, still essentially pristine regions, home to a wide array of plant and animal species, are now under assault by encroaching human development. However, the difficulty of access, the logistical barriers to scientific operations, and the lack of accurate instrumentation have prevented their comprehensive, systematic study until the ABLE projects. The ABLE-2 project, carried out jointly by the United States and Brazil, brought new technology to bear on an investigation of the largest rain forest of all, the Amazon. The impetus for this work was Space Shuttle observations of elevated CO concentrations in the upper troposphere off the coast of Brazil-suspected to arise from a combination of biomass burning and oxidation of natural hydrocarbons, notably isoprene, emitted by the forest itself. The ABLE-2 project consisted of two expeditions--the first in the Amazonian dry season (ABLE-2A, July-August 1985), and the second in the wet season (ABLE-2B, April-May 1987). The ABLE-2 core research data were gathered by a series of instrumented Electra aircraft flights that stretched from Belem, at the mouth of the Amazon River, to Tabatinga, on the Brazil-Colombia border, from a base at Manaus, in the heart of the forest. These observations were supplemented by ground-based chemical and meteorological measurements in the dry forest, the Amazon floodplain, and tributary rivers through use of enclosures (for flux measurements), an instrumented tower in the jungle, a large tethered balloon, and weather and ozone sondes. At their peak, the ABLE- 2 expeditions involved 60 U.S. scientists and more than 100 Brazilian scientists, working together in the spirit of international, interdisciplinary cooperation essential for the study of global change. Air quality above the Amazon jungle is extremely clean during the wet season but deteriorates dramatically during the dry season as the result of biomass burning. (See Figure 2.) This degradation is caused mostly by burning at the edges of the forest. Under the worst conditions, trace-gas concentrations at aircraft altitudes approach those typically observed over industrialized regions. This is a spectacular example of long-range transport of pollution into a pristine environment. Figure 2. Dramatic Difference in Average Daily Cloud Cover Over Amazon Basin marks transition from dry to wet season, as shown in these environmental satellite images. (Red, yellow; high cloud. Light blue: little or no cloud cover.) ABLE-2 flights spanned the entire basin and obtained data during both seasons. Figure 3. Effect of Biomass Burning is shown by variation of tropospheric carbon monoxide with height above Amazon rainforest and with longitude along Amazon River, as measured by ABLE-2A flights at the end of wet season (July) and beginning of dry season (August). Note enormous CO increase in August as a result of biomass burning. The undisturbed rain forest is the most efficient sink for O3 yet discovered.Amazonian O3 decomposition rates were found to be 5 to 50 times higher than those previously measured over pine forest and water surfaces. The disappearance of such a strong ozone sink through deforestation would have global implications for atmospheric chemistry. The Amazon River floodplain is a globally significant source of methane, supplying about 12% of the estimated worldwide total from all wetlands sources. ABLE-2 studies of spectacular atmospheric circulations over Amazonia have shed new light on links between the Amazon regions and global circulation. Individual convective storms transport 200 megatons of air per hour, of which 3 megatons is water vapor that releases 100.000 megawatts of energy into the atmosphere through condensation into rain. Replacement of forest with wetlands or pasture is likely to have a large impact on this enormous furnace, with attendant effects on atmospheric circulation patterns, and hence climate. The changes being produced by deforestation and biomass burning may accelerate the greenhouse effect through a positive-feedback mechanism involving the OH radical, as well as through direct changes in greenhouse-gas source and sink strengths. Most tropospheric trace gases are removed through reactions with OH; as biological combustion processes drive CO, CH4, and other trace gases to higher aggregate levels, OH levels generally fall. There is thus less OH remaining to retard a growing accumulation of greenhouse gases. Harriss, R.C., S.C. Wofsy, M. Garstang, E V. Browell, L.C.B. Molion, R.J. McNeal, J.M. Hoell, Jr., R.J. Bendura, S.M. Beck, R.L. Navarro, J.T. Riley, and R.L. Snell, The Amazon Boundary Layer Experiment (ABLE-2A): Dry season 1985. J. Geophys. Res., Vol. 93, No. D2, February 20, 1988, pp. 1351-1360. 1. Andreae, M. O., and T. W. Andreae, The cycle of biogenic sulfur compounds over the Amazon Basin, 1, dry season. J. Geophys. Res., Vol. 93, No.D2, February 20, 1988, pp.1487-1497. 2. Andreae, M. O., E. V. Browell, M. Garstang, G. L. Gregory, R. C. Harriss, G. F. Hill, D. J. Jacob, M. C. Pereira, G. W. Sachse, A. W. Setzer, P. L. Silva Dias, R. W. Talbot, A. L. Torres, and S. C. Wofsy, Biomass-burning emissions and associated haze layers over Amazonia. J. Geophys. Res., Vol. 93, No. D2, February 20, 1988, pp. 1509-1527. 3. Andreae, M. O., R. W. Talbot, T. W. Andreae, and R. C. Harriss, Formic and acetic acid over the central Amazon region, Brazil, I, Dry season. J. Geophys. Res., Vol. 93, No. D2, February 20, 1988, pp. 1616-1624. 4. Artaxo, P., H. Storms, F. Bruynseels, R. van Grieken, and W. Maenhaut, Composition and sources of aerosols from the Amazon basin. J. Geophys. Res., Vol. 93, No. D2, February 20, 1988, pp. 1605-1615. 5. Bartlett, K. B., P. M. Crill, D. I Sebacher, R. C. Harriss, J. O. Wilson, and J. M. Melack, Methane flux from the central Amazonian floodplain. J. Geophys. Res., Vol 93, No. D2, February 20, 1988, pp. 1571-1582. 6. Brito, J. L. S., Estimations of temperature and humidity of the canopy in Amazon forest using microwave data from SMMR sensor of Nimbus-7 satellite. INPE-5444- TDI/490(Thesis), September 1992, 108 p.
7. Browell, E. V., G. L. Gregory, R. C. Harriss, and V. W. J. H. Kirchhoff, Tropospheric ozone and aerosol distributions across the Amazon basin. J. Geophys. Res., Vol. 93, No. D2, February 20, 1988, pp. 1431-1451. 8. Butler, C. F., Theory and operation of the Gould 32/27 programs ABLE-2A and EBLE for the tropospheric air motion measurement system - Final report, January 1-December 31, 1985. Old Dominion Univ., NASA CR-176856, June 1986, 102 p.
9. Crill, P. M., K. B. Bartlett, J. O. Wilson, D. I. Sebacher, R. C. Harriss, J. M. Melack, S. MacIntyre, L. Lesack, and L. Smith-Morrill, Tropospheric methane from an Amazonian floodplain lake. J. Geophys. Res., Vol. 93, No. D2, February 20, 1988, pp. 1564-1570. 10. Dacostapereira, M., Detection, monitoring and analysis of some environmental effects of fires in the Amazon region through utilization of NOAA and LANDSAT satellite imagery and aircraft data. M. S. Thesis, Instituto de Pesquisas Espaciais, INPE -4503-TDL/326, 1987, 258 p.
11. Davis, K. J., Surface fluxes of trace gases derived from convective-layer profiles. Ph.D. Thesis, U. of Colorado, 1992, 291 p.
12. Davis, K. J., D. H. Lenschow, and P. R. Zimmerman, Biogenic nonmethane hydrocarbon emissions estimated from tethered balloon observations. J. Geophys. Res., Vol. 99, No. D12, December 20, 1994, pp. 25587-25598. 13. Devol, A. H., J. E. Richey, W. A. Clark, S. L. King, and L. A. Martinelli, Methane emissions to the troposphere from the Amazon floodplain. J. Geophys. Res., Vol. 93, No. D2, February 20, 1988, pp. 1583-1592. 14. Ferreira, M. Elias, Three dimensional algorithms for retrieving temperature and moisture profiles from radiances obtained through VAS. Ph.D. Thesis, Instituto de Pesquisas Espaciais, INPE-4104-TDL/258, February 1987, 217 p.
15. Ferreira, M. E., Three-dimensional algorithms for temperature and humidity profile retrievals from radiances obtained by VAS. Instituto de Pesquisas Espaciais, Publication No. INPE-4104-TDL/258, February 1987. 16. Ferreira, N. J., Large -scale features of the atmospheric water vapor transport over the Amazon region. Ph. D. Thesis, Univ. of Wisconsin, 1987, 154 p.
17. Fishman, J. and E. V. Browell, Comparison of satellite total ozone measurements with the distribution of tropospheric ozone obtained by an airborne UV-DIAL system over the Amazon Basin. Tellus, 40B, No. 5, Nov. 1988, pp. 393-407. 18. Fitzjarrald, D. R., B. L. Stormwind, G. Fisch, and O. M. R. Cabral, Turbulent transport observed just above the Amazon forest. J. Geophys. Res., Vol. 93, No. D2, February 20, 1988, pp. 1551-1563. 19. Garstang, M., Atmospheric surface and boundary layers of the Amazon basin-Final report. Univ. of VA, NASA CR- 180628, March 1987, 161 p.
20. Garstang, M. S. Greco, J. Scala, R. C. Harriss, E. V. Browell, G. W. Sachse, J. Simpson, W. -K. Tao, and A. Torres, Trace gas exchanges and transports over the Amazonian rain forest. presented at AMS International Conference on Southern Hemisphere Meteorology, Wellington, New Zealand, December 1-5, 1986, Preprint, 5 p.
21. Garstang, M., J. Scala, S. Greco, R. Harriss, S. Beck, E. Browell, G. Sachse, G. Gregory, G. Hill, J. Simpson, W. -K. Tao, and A. Torres, Trace gas exchanges and convective transports over the Amazonian rain forest. J. Geophys. Res., Vol. 93, No. D2, February 20, 1988, pp. 1528-1550. 22. Gregory, G. L., E. V. Browell, and Linda S. Warren, Boundary layer ozone: An airborne survey above the Amazon basin. J. Geophys. Res., Vol. 93, No. D2, February 20, 1988, pp. 1452-1468. 23. Harriss, R. C., S. C. Wofsy, M. Garstang, E. V. Browell, L. C. B. Molion, R. J. McNeal, J. M. Hoell, Jr., R. J. Bendura, S. M. Beck, R. L. Navarro, J. T. Riley, and R. L. Snell, The Amazon Boundary Layer Experiment (ABLE-2A): Dry season 1985. J. Geophys. Res., Vol. 93, No. D2, February 20, 1988, pp. 1351-1360. 24. Jacob, D. J., and S. C. Wofsy, Photochemistry of biogenic emissions over the Amazon forest. J. Geophys. Res., Vol. 93, No. D2, February 20, 1988, pp. 1477-1486. 25. Kaplan, W. A., S. C. Wofsy, M. Keller, and J. M. da Costa, Emission of NO and deposition of O3 in a tropical forest system. J. Geophys. Res., Vol. 93, No. D2, February 20, 1988, pp. 1389-1395. 26. Keller, M., W. A. Kaplan, S. C. Wofsy, and J. M. da Costa, Emissions of N2O from tropical forest soils: Response to fertilization with NH4+, NO3-, and PO43-. J. Geophys. Res., Vol. 93, No. D2, February 20, 1988, pp. 1600-1604. 27. 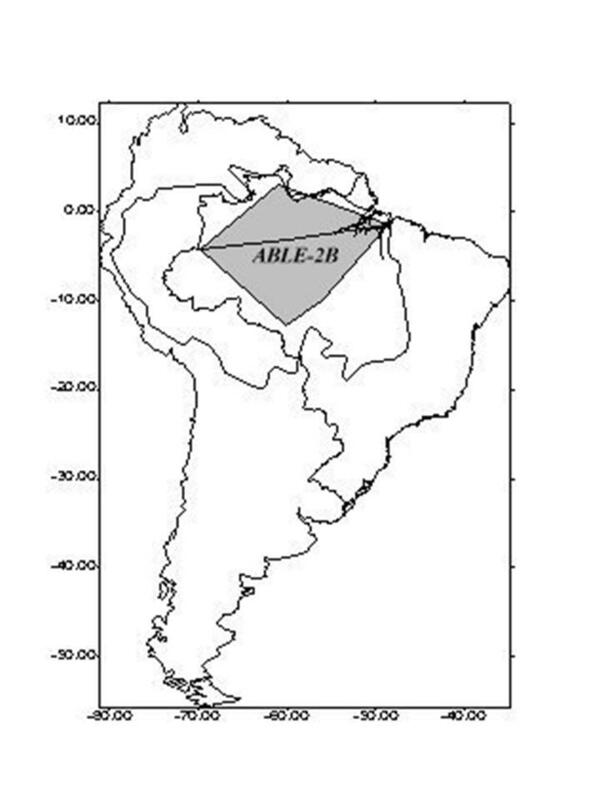 Kirchhoff, V. W. J. H., Surface ozone measurements in Amazonia. J. Geophys. Res., Vol. 93, No. D2, February 20, 1988, pp. 1469-1476. 28. Kirchoff, V. W. J. H., E. V. Browell, and G. L. Gregory, Ozone measurements in the troposphere of an Amazonian rain forest environment. J. Geophys. Res., Vol. 93, No. D12, February 20, 1988, pp. 15,850-15,860. 29. Livingston, G. P., P. M. Vitousek, and P. A. Matson, Nitrous oxide flux and nitrogen transformations across a landscape gradient in Amazonia. J. Geophys. Res., Vol. 93, No. D2, February 20, 1988, pp. 1593-1599. 30. Madrononich, S., R. B. Chatfield, J. G. Calvert, G. K. Moortgat, B. Veyret, and R. Lesclaux, A photochemical origin of acetic acid in the troposphere. Geophys. Res. Ltrs., Vol. 17, December 1990, pp. 2361-2364. 31. Martin, C. L., D. Fitzjarrald, M. Garstang, A. P. Olivera, S. Greco, and E. Browell, Structure and growth of the mixing layer over the Amazonian rain forest. J. Geophys. Res., Vol. 93, No. D2, February 20, 1988, pp. 1361-1375. 32. McNeal, R. J., Preface. J. Geophys. Res., Vol. 93, No. D2, February 20, 1988, p.1349. 33. Periera, M. deC. and A. W. Setzer, Detection of fires and smoke plumes in the Amazon region by means of NOAA satellite images. Instituto de Pesquisas Espaciais, Publication No. INPE-3924-PRE/958, June 1986, 42 p.
34. Pereira, M. C. and A. W. Setzer, Detection of biomass burning and smoke plumes in the Amazon region through NOAA satellite imagery. presented at the 4th Brazilian Remote Sensing Symposium and 6th SELPER Plenary Meeting, in Proceedings at Latin American Symposium on Remote Sensing, 1986, pp. 701-709. 35. Pickering, K. E., A. M. Thompson, J. R. Scala, W. -K. Tao, and J. Simpson, Ozone production potential following convective redistribution of biomass burning emissions. J. Atmos. Chem., Vol. 14, No. 1-4, April 1992, pp. 297-313. 36. Pickering, K. E., A. M. Thompson, J. R. Scala, W. - K. Tao, J. Simpson, and M. Garstang, Photochemical ozone production in tropical squall line convection during NASA Global Tropospheric Experiment/Amazon Boundary Layer Experiment 2A. J. Geophys. Res., Vol. 96, No. D2, February 20, 1991, pp. 3099-3114. 37. Rasmussen, R. A., and M. A. K. Khalil, Isoprene over the Amazon basin. J. Geophys. Res., Vol. 93, No. D2, February 20, 1988, pp. 1417-1421. 38. Richardson, J. L., J. Fishman, and G. L. Gregory, Ozone budget over the Amazon: Regional effects from biomassburning emissions. J. Geophys Res., Vol. 96, No. D7, July 20, 1991, pp. 13073-13087. 39. Sachse, G. W., R. C. Harriss, J. Fishman, G. F. Hill, and D. R. Cahoon, Carbon monoxide over the Amazon basin during the 1985 dry season. J. Geophys. Res., Vol. 93, No. D2, February 20, 1988, pp. 1422-1430. 40. Shipham, M. C., S. T. Shipley, and C. R. Trepte, Global meteorological data facility for real-time field experiments support and guidance. NASA TM-4023, May 1988, 26 p.
41. Talbot, R. W., M. O. Andreae, T. W. Andreae, and R. C. Harriss, Regional aerosol chemistry of the Amazon basin during the dry season. J. Geophys. Res., Vol. 93, No. D2, February 20, 1988, pp. 1499-1508. 42. Torres, A. L., and H. Buchan, Tropospheric nitric oxide measurements over the Amazon basin. J. Geophys. Res., Vol. 93, No. D2, February 20, 1988, pp. 1396-1406. 43. Viswanadham, Y., L. C. B. Molion, A. O. Manzi, L. D. A. Sa, V. P. S. Filho, R. G. B. Andre, J. L. M. Nogueira, and R. C. dos Santos, Micrometeorological measurements in Amazon forest during GTE/ABLE-2A mission. J. Geophys. Res., Vol. 95, No. D9, August 20, 1990, pp. 13669-13682. 44. Watson, C. E., J. Fishman, G. L. Gregory, and G. W. Sachse, A comparison of wet and dry season ozone and CO over Brazil using in situ and satellite measurements, Global Biomass Burning, J. S. Levine, ed., MIT Press, Cambridge, MA, 1991, pp. 115-121. 45. Wofsy, S. C., R. C. Harriss, and W. A. Kaplan, Carbon dioxide in the atmosphere over the Amazon basin. J. Geophys. Res., Vol. 93, No. D2, February 20, 1988, pp. 1377-1387. 46. Zimmerman, P. R., J. P. Greenberg, and C. E. Westberg, Measurements of atmospheric hydrocarbons and biogenic emission fluxes in the Amazon boundary layer. J. Geophys. Res., Vol. 93, No. D2, February 20, 1988, pp. 1407-1416. 1. Andreae, M. O., H. Berresheim, H. Bingemer, D. J. Jacob, B. L. Lewis, S.-M. Li, and R. W. Talbot, The atmospheric sulfur cycle over the amazon basin, 2, wet season. J. Geophys. Res., Vol. 95, No. D10, September 20, 1990, pp. 16,813- 16,824. 2. Andreae, M. O., R. W. Talbot, R. C. Harriss, H. Berresheim, and S. M. Li, Precipitation chemistry in central Amazonia. J. Geophys. Res., Vol. 95, No. D10, September 20, 1990, pp. 16,987-16,999. 3. Artaxo, P., Characterization of biogenic aerosol particles from the Amazon basin during dry and wet season. in Nordic Symposium on Atmospheric Chemistry, Stockholm Univ., March 1990, 4 p.
4. Artaxo, P. and H. -C. Hansson, Size distribution of biogenic aerosol particles from the Amazon basin. Atmos. Environ., Vol. 29, No. 3, February 1995, pp. 393-402. 5. Artaxo, P., W. Maenhaut, H. Storms, and R. Van Grieken, Aerosol characteristics and sources for the Amazon basin during the wet season. J. Geophys. Res., Vol. 95, No. D10, September 20, 1990, pp. 16,971-16,985. 6. Bakwin, P. S., S. C. Wofsy, and S-M Fan, Measurements of reactive nitrogen oxides (NOy) within and above a tropical forest canopy in the wet season. J. Geophys. Res., Vol. 95, No. D10, September 20, 1990, pp. 16,765-16,772. 7. Bakwin, P. S., S. C. Wofsy, S-M Fan, M. Keller, S. E. Trumbore, and J. M. da Costa, Emmission of nitric oxide (NO) from tropical forest soils and exchange of NO between the forest canopy and atmospheric boundary layers. J. Geophys. Res., Vol. 95, No. D10, September 20, 1990, pp. 16,755- 16,764. 8. Bartlett, K. B., P. M. Crill, J. A. Bonassi, J. E. Richey, and R. C. Harriss, Methane flux from the Amazon river floodplain: Emissions during rising water. J. Geophys. Res., Vol. 95, No. D10, September 20, 1990, pp. 16,773- 16,788. 9. Browell, E. V., G. L. Gregory, R. C. Harriss, and V. W. J. H. Kirchhoff, Ozone and aerosol distributions over the Amazon basin during the wet season. J. Geophys. Res., Vol. 95, No. D10, September 20, 1990, pp. 16,887-16,901. 10. Cautenet, S. and B. Lefeivre, Contrasting behavior of gas and aerosol scavenging in convective rain: A numerical and experimental study in the African equatorial forest. J. Geophy. Res., Vol. 99, No. D6, June 20, 1994, pp.13013- 13024. 11. Chanton, J. P., P. M. Krill, K. B. Bartlett, and C. S. Martens, Amazon capims (floating grassmats): A source of 13C enriched methane to the troposphere. Geophys. Res. Ltrs., Vol. 16, August 1989, pp. 799-802. 12. Cohen, J. C. P., M. A. F. Silva Dias, and C. A. Nobre, Environmental conditions associated with Amazonian squall lines: A case study. Monthly Weather Review, Vol. 123, No. 11, November 1995, pp. 3163-3174. 13. Connors, V., M. Garstang, and S. Nolf, Atmospheric weather regimes over tropical south America. Proceedings AMS 19th Conf. on Hurr. and Trop. Meteor., Miami, FL, 1991, pp. 64-67. 14. Fan, S-M., S. C. Wofsy, P. S. Bakwin, D. J. Jacob, and D. R. Fitzjarrald, Atmosphere-biosphere exchange of CO2 and O3 in the Central Amazon forest. J. Geophys. Res., Vol. 95, No. D10, September 20, 1990, pp. 16,851-16,864. 15. Fitzjarrald, D. R.and K. E. Moore, Mechanisms of nocturnal exchange between the rain forest and the atmosphere. J. Geophys. Res., Vol. 95, No. D10, September 20, 1990, pp. 16,839-16,850. 16. Fitzjarrald, D. R., K. E. Moore, O. M. R. Cabral, J. Scolar, A. O. Manzi, and L. D. de Abreu Sa, Daytime turbulent exchange between the Amazon forest and the atmosphere. J. Geophys. Res., Vol. 95, No. D10, September 20, 1990, pp. 16,825-16,838. 17. Forti, M. C., L. M. M. Nordeman, Rainwater and throughfall chemistry in a "terra firme" rain forest: Central Amazonia. J. Geophys. Res., Vol. 96, No. D4, April 20,1991, pp. 7415-7421. 18. Garstang, M., Destruction of the rain forest and climate change. Accepted for publication in the New Zealand Geographer, Special Volume, 1991. 19. Garstang, M., C. Cosgrove, R. Swap, and S. Greco, Estimation of tropical rainfall. Tropical Rainfall Measurements, ed. by J. S. Theon and N. Fugono, A. Deepak Publishing, Hampton, VA, 1988. 20. Garstang, M. and S. Greco, Trace gas and aerosol transports into and out of the Amazon basin - Progress report, January 1,1990-August 31, 1991. Univ. of Virginia, NASA CR- 188786, September 1991, 184 p.
21. Garstang, M. and C. Martin, PAM stations weather Amazon rainforest. The ATD Observer, Winter 1991, pp. 1-3. 22. Garstang, M., H. L. Massie, Jr., J. Halverson, S. Greco, and J. Scala, Amazon coastal squall lines. Part 1: Structure and kinematics. Monthly Weather Review, Vol. 122, No. 4, April 1994, pp. 608-622. 23. Garstang, M., S. Ulanski, S. Greco, J. Scala, R. Swap, D. Fitzjarrald, D. Martin, E. Browell, M. Shipham, R. Harriss, R. Talbot, and V. Connors, Amazon Boundary Layer Experiment (ABLE-2B): A meteorological perspective. Bull. Amer. Meteor. Soc., Vol. 71, No. 1, January 1990, pp. 19-32. 24. Greco, S., M. Garstang, S. Ulanski, and S. Houston, Nocturnal boundary layer accelarations in the Central Amazon Basin. Proceedings AMS 19th Conf. on Hurr. and Trop. Meteor., Miami, FL, 1991, pp. 140-143. 25. Greco, S., J. Scala, J. Halverson, H. L. Massie, Jr., W. -K. Tao, and M. Garstang, Amazon coastal squall lines. Part II: Heat and moisture transports. Monthly Weather Review, Vol. 122, No. 4, April 1994, pp. 623-635. 26. Greco, S., R. Swap, M. Garstang, S. Ulanski, M. Shipham, R. C. Harriss, R. Talbot, M. O. Andreae, and P. Artaxo, Rainfall and surface kinematic conditions over central Amazonia during ABLE 2B. J. Geophys. Res., Vol. 95, No. D10, September 20, 1990, pp. 17,001-17,014. 27. Greco, S., S. Ulanski, M. Garstang, and S. Houston, Low- level nocturnal wind maximum over the Central Amazon Basin. Bound.-Layer Meteor., Vol. 58, No. 1, January 1992, pp. 91- 115. 28. Gregory, G. L., E. V. Browell, L. S. Warren, and C. H. Hudgins, Amazon basin ozone and aerosol: Wet season observations. J. Geophys. Res., Vol. 95, No. D10, September 20, 1990, pp. 16,903-16,912. 29. Harriss, R. C., M. Garstang, S. C. Wofsy, S. M. Beck, R. J. Bendura, J. R. B. Coelho, J. W. Drewry, J. M. Hoell, Jr., P. A. Matson, R. J. McNeal, L. C. B. Molion, R. L. Navarro, V. Rabine, and R. L. Snell, The Amazon Boundary Layer Experiment: Wet season 1987. J. Geophys. Res., Vol. 95, No. D10, September 20, 1990, pp. 16,721-16,736. 30. Harriss, R. C., G. W. Sachse, G. F. Hill, L. O. Wade, and G. L. Gregory, Carbon monoxide over the Amazon basin during the wet season. J. Geophys. Res., Vol. 95, No. D10, September 20, 1990, pp. 16,927-16,932. 31. Harriss, R. C., S. Wofsy, and M. Garstang, Air chemistry over the Amazon Basin. Proceedings AMS Symp. on Global Change Systems. Special Session on Climate Variation and Hydrology, Anaheim, CA, 1990. 32. Jacob, D. J., and P. S. Bakwin, Cycling of NOx in tropical forest canopies. Microbial Production and Consumption of Greenhouse Gases, ed. by J. E. Rogers and W. B. Whitman, American Society for Microbiology, Washington, DC, 1991, pp. 237-253. 33. Jacob, D. J., and S. C. Wofsy, Budgets of reactive nitrogen, hydrocarbons, and ozone over the Amazon forest during the wet season. J. Geophys. Res., Vol. 95, No. D10, September 20, 1990, pp. 16,737-16,754. 34. Keller, M., D. J. Jacob, S. C. Wofsey, and R. C. Harriss, Effects of tropical deforestation on global and regional atmospheric chemistry. Climatic Change, Vol. 19, No. 1, September 1991, pp.139-158. 35. Kirchhoff, V. W. J. H. and I. M. O. Dasilva, Recent measurements of ozone in the Amazon forests. presented at the 2nd Regional Meeting on Geophysics, Salvador, Brazil, November 25-27, 1987, Instituto de Pesquiais Espaciais, Report INPE-4494-PRE/1258, May 1988, 20 p.
36. Kirchhoff, V. W. J. H. and E. V. A. Marinho, Recent observations of carbon monoxide in the Amazon rain forest. presented at 2nd Regional Meeting of Geophysics, Salvador, Brazil, November 25-27, 1987, Instituto de Pesquisas Espaciais, Report INPE-4478-PRE/1245, February 1988, 21 p.
37 Kirchhoff, V. W. J. H. and E. V. A. Marinho, Surface CO results from the ABLE-2B expedition to Amazonia. presented at the 1988 AGU Spring Meeting, May 16-20, 1988, Instituto de Pesquisas Espaciais, INPE-4501-PRE/1258, March 1988, 21 p.
38. Kirchhoff, V. W. J. H., and E. V. A. Marinho, Surface carbon monoxide measurements in Amazonia. J. Geophys. Res., Vol. 95, No. D10, September 20, 1990, pp. 16,933-16,943. 39. Kirchhoff, V. W. J. H., I. M. O. da Silva, and E. V. Browell, Ozone measurements in Amazonia: Dry season versus wet season. J. Geophys. Res., Vol. 95, No. D10, September 20, 1990, pp. 16,913-16,926. 40. Maenhaut, W., G. Koppen, and P. Artaxo, Long-term atmospheric aerosol study in Cuiab, Brazil: Multielemental composition, composition, sources, and impact of biomass burning. Biomass Burning and Global Change, ed. J. S. Levine, MIT Press, 1996, Vol. 2, Chapt.61, pp.637-652. 41. Martin, D. W., B. Goodman, T. J. Schmit, and E. C. Curtim, Estimates of daily rainfall over the Amazon basin. J. Geophys. Res., Vol. 95, No. D10, September 20, 1990, pp. 17,043-17,050. 42. Massie, Jr., H. L., The structure and energetics of Amazon squall lines. Ph.D. Thesis, Univ. of Virginia, 1991, 211 p.
43. Massie, H. and M. Garstang, Heat and moisture budgets in an Amazon traveling disturbance line. Proceedings AMS 19th Conf. on Hurr. and Trop. Meteor., Miami, FL, 1991, pp. 162-167. 44. Matson, P. A., P. M. Vitousek, G. P. Livingston, and N. A. Swanberg, Sources of variation in nitrous oxide flux from Amazonian ecosystems. J. Geophys. Res., Vol. 95, No. D10, September 20, 1990, pp. 16,789-16,798. 45. Menzel, W. P., T. J. Schmit, and D. P. Wylie, Cloud characteristics over central Amazonia during GTE/ABLE 2B derived from multispectral visible and infrared spin scan radiometer atmospheric sounder observations. J. Geophys. Res., Vol. 95, No. D10, September 20, 1990, pp. 17,039- 17,042. 46. Pereiradeoliveira, A., Planetary boundary layer dynamics over the Amazon rain forest. Ph. D. Thesis, State Univ. of New York-Albany, 1990, 312 p.
47. Pickering, K. E., A. M. Thompson, J. R. Scala, W. -K. Tao, R. R. Dickerson and J. Simpson, Free tropospheric ozone production following entrainment of urban plumes into deep convection. J. Geophys. Res., Vol. 97, No. D16, November 20, 1992, pp. 17985-18000. 48. Ritter, J. A., D. H. Lenschow, J. D. Barrick, G. L. Gregory, G. W. Sachse, G. F. Hill, and M. A. Woerner, Airborne flux measurements and budget estimates of trace species over the Amazon basin during the GTE/ABLE 2B expedition. J. Geophys. Res., Vol. 95, No. D10, September 20, 1990, pp. 16,875- 16,886. 49. Scala, J. R., M. Garstang, W. -K. Tao, K. E. Pickering, A. M. Thompson, J. Simpson, V. W. J. H. Kirchhoff, E. V. Browell, G. W. Sachse, A. L. Torres, G. L. Gregory, R. A. Rasmussen, and M. A. K. Khalil, Cloud draft structure and trace gas transport. J. Geophys. Res., Vol. 95, No. D10, September 20, 1990, pp. 17,015-17,030. 50. Scala, J., W. -K. Tao, K. Pickering, A. Thompson, J. Simpson, and M. Garstang, The effect of tropical squalltype convection on the vertical transport and redistribution of trace gases. Proceedings AMS Seventh Joint Conf. on Appl. Air Poll. Meteor. with AWMA, New Orleans, LA, 1991, pp. 228-231. This data is available through the Oak Ridge National Laboratory (ORNL) Distributed Active Archive Center (DAAC) [http://daac.ornl.gov].